"Gmail is normally spam mail"
I hear that a lot - often in the context of discussing website lead conversions with capital equipment manufacturers. Generally my clients (companies with complex sales processes in the B2B world) consider their qualified buyers to be businesses and they aren't generally interested in random individuals that aren't associated with prospect companies. Ever find yourself with your tablet, sitting on the couch watching sports, news or the Late Show and searching for some ideas around a business challenge that you encountered that day? Or on a Saturday morning before you head out to cut the grass? Often in those situations users will submit forms using convenient or default email addresses on those devices - which may be different than their desk/lap top at work. And sometimes people dread filling out forms because they fear they'll be harassed - so they create form email addresses. That doesn't mean they're not a good lead. In fact they could be a senior engineer at a target account. That's right. Only a portion of Gmail addresses end in "@gmail.com." Many organizations rely on Google's mail servers to manage their email systems. 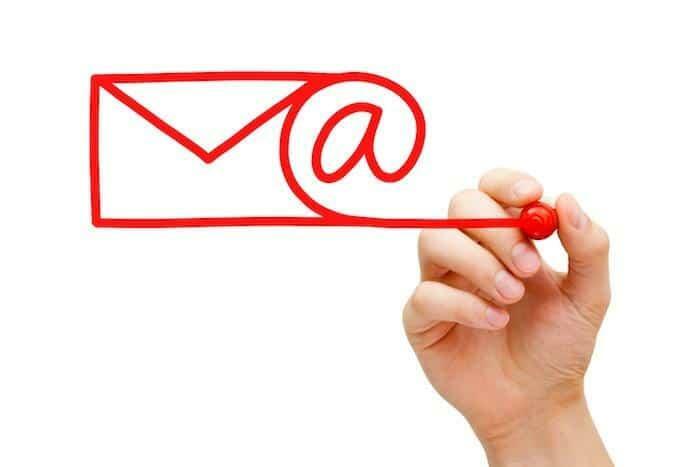 With a small, incremental/user cost, you can run email for your domain through Gmail servers. That means no local Exchange server, and no hosted Exchange. It also means that when you speak in a dismissive way of Gmail addresses you should distinguish between those with the Gmail TLD vs. those which are managed through Googles servers. This is different than forwarding - it's the actual email system for "@yourcompany.com", and by incorporating an SPF record, nobody will ever know that it's not actually coming from your own traditional internal server. Why haven't you heard of this? Honestly it's not necessarily in the selfish interest of your IT guru to tell you that there's a simpler way which doesn't involve servers, software renewals and complex user management! I've known IT folks who genuinely weren't even aware of this option. Of course the downside is that Eric Schmidt and the entire Google colossus potentially know the content of your emails and with whom you communicate frequently...but remember, many of those with whom you're communicating now use it, so it's probably all been captured anyway! Google's APIs (application programming interface) are widely used to integrate GMail with other cloud apps. CRM, marketing automation, and calendar tools are examples of common integrations. This means that your emails, schedules and contact details are seamlessly used across applications - for instance seeing all contact activity (bulk email, individual email, meetings, calls, website visits, offer conversions, proposals opened, and more) in one place. And for sales reps who either bounce from phone to screen in the office, or app to app on their mobile devices on the road, it creates efficiency and boosts effectiveness. Email deliverability is becoming a bigger challenge for companies. Simple spam reports and hard bounces that offered a black and white indication of email performance are now supplemented with greymail ratings based on overall engagement. Generally Gmail (free and paid accounts) download pictures (probably because Google is focused on user experience and is confident in their spam & virus filtering.) In contrast, generally Outlook's default setting is to NOT download pictures. That means that email sent to people who primarily use Outlook as their client will show a higher level of unread than that which uses a Gmail web or application interface. While this isn't a reason for you to use, or not use, Gmail, it is a subject about which you need to be aware. Further, it's important to understand the background to make informed decisions about some greymail "solutions." For instance, HubSpot's email suppression tool for "low engagement" contacts. If you do any business internationally you've probably found a difference in email address trends. Whereas early access to .com domains and reliable infrastructure in the US have contributed to widespread use of company domains with email, in many international markets free addresses are quite common - even for official business. Not only will you often find folks from substantial businesses using "freemail" accounts, I've even done considerable, legitimate, business with foreign government officials, even at Ministerial level, who have used Gmail and yahoo addresses. So if international business is an important component (or should be) of your revenue growth strategy, then it's risky to discount freemail addresses. Behind this discussion of Gmail, though, is a more compelling question for most industrial manufacturers. "How can we have a more predictable complex sales process?" One bit potential contributor may be really savvy implementation of marketing automation. Think you've already done that? Not even sure what it means? Either way, this free guide outlines how you can use it to grow sales - from the standard approaches through much more complex techniques.